Charges for a wide variety of services and privileges that are made available in connection with the transportation of goods. Essentially, all charges other than the freight charges. Examples include: detention, demurrage, storage, etc. IMC's can acquire an assignment of units. The purpose of taking units under assignment is so that the units will not be returned empty to the ramp and will constantly be re-loaded and shipped in a high volume lane on the rail. In return, the customer typically receives a lower per diem rate. The time equipment is grounded and available for pick-up by the customer. The return move of a car or container towards the point where the initial load originated or to handle a shipment in the direction of the light flow of traffic. The actual owner of the lading that is being shipped. The IMC negotiates transportation services and rates on behalf of the beneficial owner. Clean — Either a straight or order bill of lading issued by a carrier declaring that the freight has been received in an appropriate condition, without the presence of defects or shortage. Exchange — A bill of lading issued by the carrier or agent that is substituted for the original bill of lading, where the middleman is shown as the shipper and protects the identity of the original freight supplier. Export — A bill of lading that is issued to cover a shipment consigned to a foreign country. Order — A negotiable document that is issued to the order of a shipper or consignee for the delivery of the freight and can be transferred by endorsement to third parties in accordance with its terms. Straight — A non-negotiable document that is issued to a specified consignee for the delivery of the freight and that cannot be endorsed by another party. Surrender of the original bill is not required upon delivery of the freight unless necessary to identify consignee. Wood, metal or other approved supports to keep shipments in place in or on rail cars, containers and trailers. This is not as onerous as one would expect. Railroads help shippers configure load plans. Motor Carrier slang indicating a non-revenue movement without a trailer or container attached. A three-part series of characters given out by REZ-1 to an IMC who, in turn, will give it to a drayage provider so that they can use it as a ramp to pick up an empty unit for loading and shipment. The first four characters indicate the unit's program and size (ex. EU48. E means EMP. U means standard. 48 means 48 feet long.). The next character is the reservation type (ex. G means general). The last 5 characters are a series of randomly chosen numbers (ex. 34772). After a reservation's shipment has been delivered and the reservation has moved into billing by REZ-1, the booking/reservation number can be "recycled" and applied to some future reservation. An enclosed railcar, typically forty to fifty feet long, used for packaged freight and some bulk commodities. The process of separating a load into individual shipments, then routing to various destinations. An agent who arranges interstate movements of goods through other carriers. A term used to describe an intermodal product for which an allotment of "free days" or relief of per diem is built into the line haul rate. SPDU containers are marketed as a bundled product. A rubber-tired trailer under-frame on which a container is mounted for street or highway transport. Railroad with operating revenues of more than $259.4 million annually. The location designated by carriers for the receiving of cargo to be loaded into containers by the carrier or the bonded location designated by carriers for devanning of containerized cargo. Designed to handle shipments of free flowing dry bulk commodities. The movement of a container on a railroad flatcar. This movement is made without the container being mounted on a chassis. The article that is being shipped. A transportation line engaged in the business of handling persons or goods for compensation and for all persons impartially. The individual or organization to which freight is shipped. The individual or organization shipping freight to a consignee. A receptacle that resembles a truck trailer without wheel (chassis) that is lifted onto flatcars. Containers are designed for all modes of intermodal transport. 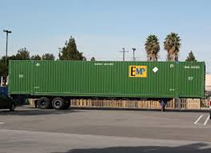 Most containers are 20-, 45-, 48- or 53-feet in length. A railroad or privately owned yard used for the storage of containers when not in use. Crossover charges occur when a unit is taken from one ramp and returned to a different railroad in the same, or a different metro area. In specific cities, the railroads may impose crossover charges. The time a container or trailer must be ingated at the terminal to meet a scheduled train loading for departure. A long distance drayage movement of empty equipment required to pick up a load. A train that transports a dedicated commodity or type of cars. In the case of intermodal, intermodal trains only carry trailers and/or containers. A penalty for exceeding free time allowed for loading or unloading at a pier or freight terminal. Also, demurrage is a charge for undue detention of transportation equipment or carriers in port while loading or unloading. The railroad terminal that a unit will go to, to be picked up by truck for delivery. A charge made on trailers/containers held by or for a consignor/consignee for loading or unloading, forwarding directions or any other purpose. Typically, there are 2 hours free time before detention becomes an issue. Transport of freight via 53’ containers through rail and truck modes within North America. A movement of lading from the customer’s dock to the receiver’s dock. A movement of lading from the customer’s dock to the destination intermodal ramp closest to the receiver. The movement of containers on a rail car that enable the one container to be stacked on another container. The movement of a container or trailer to or from the railroad intermodal terminal to or from the customer's facility for loading or unloading. When a drayman is required to assist in the loading/unloading of a container or trailer. The railroads may impose drop charges at certain ramps to units that return to the ramp empty. Drop charges are used to prevent congestion. Drayman drops loaded or unloaded unit at shipper or receiver and hooks up to unit which was previously dropped and returns it to the ramp. When a drayman goes to a ramp to pick up a container and for some reason leaves without one. The material used to protect or support freight in containers or trailers. Same as demurrage; used more in rail industry communications than in legal contracts. To prohibit the acceptance and handling of freight. An embargo may be caused by acts of God such as tornadoes, floods, inclement weather, congestion, etc. A 53’ domestic interline container service offered by Union Pacific and Norfolk Southern. A freight car having a floor, without housing or body. Flat cars are frequently used to carry trailers or oversized/odd-shaped commodities that are not subject to damage from the elements. When a container is picked up off of the ground and mounted on a chassis for street or highway transport. Charges assessed to a shipper when the railroad is required to provide an unnecessary or extra flip. An example of this is when a private container is grounded off of a train and no chassis is available at that time. A flip charge is assessed because a flip is required at a time after the train is unloaded. The period allowed the owner to accept delivery before storage or detention charges begin to accrue. A defined geographic area, typically a city or port area, similar to a free port, although can exist within the confines of a DC or manufacture facility, which is considered outside the USA as it relates to the collection of customs duty, import and export taxes and other cargo admissibility restrictions. Free trade zones are created to improve the competitiveness of warehousing, manufacturing, processing and assembly businesses. Free trade zones can eliminate duty, defer duty or transform dutiable amount through transforming individual parts into a different custom classification through an assembly or manufacturing process. The process of combining multiple separate consignments into a single lot or container load constituting a more economical shipping unit for shipment over all or some of the transportation segments. Upon completion of the “consolidated” shipment segment, the process must be reversed- the individual consignments must be separated out for delivery or on-shipment to the respective individual consignees. A point at an intermodal terminal where a clerk checks in and out all containers and trailers. All reservations and paperwork are checked at the gatehouse. A point through which freight commonly moves from one territory or carrier to another. Units can have different grade types, such as "food grade," "paper grade," "general grade," etc. All EMP units are general grade. The entire weight of shipment, including packaging and any additional materials associated with the shipment. The consistent vibration intermodal loads experience while riding on the rails. The vibration is not intense, but consistent and if not properly blocked can move the freight both vertically and horizontally in the container. Substance or combination thereof which, because of its quantity, concentration, physical or chemical characteristics, may cause or significantly pose a substantial hazard to human health or the environment when improperly packaged, stored, transported or otherwise managed. Rail or truck term used to define the highest revenue generating shipping lane from shipper to receiver. Household goods are personal effects and property used within the household. Under rail circulars HHG is a restricted commodity with limited liability. The status of merchandise admitted provisionally to a country without payment of duties either for storage in a bonded warehouse or for transshipment to another point where duties will eventually be imposed and paid. Term applied to units arriving at a railroad terminal over the road, from a trucking company. The exchange of rail cars between connecting railroads. Agreement between a railroad and a drayage company that allows a specific drayage company to drop off or pick up railroad or private intermodal equipment at the said railroad's facilities. Also known as an Equipment Interchange Agreement. Freight moving from point of origin to destination over two or more transportation lines. Transport of freight by two or modes of transportation. Examples are: ship-rail, rail-truck. A railroad facility designed for the loading and unloading of containers and trailers to and from flat cars for movement on the railroad and subsequent movement on the street or highway. IMCs purchase rail and truck transportation services, utilize equipment from multiple sources, and provide other value-added services under a single freight bill to the ultimate shipper. Examples are: ship-rail, rail-truck. Various types of IMC’s. Bi-Modal: Own COFC boxes; and do the majority of their own dray work with company drivers and equipment. Have a direct relationship with the railroads. Asset-Light: Own COFC boxes; do a portion of the dray with company drivers; tap into the railroad assets to augment capacity; and outsource some of the dray to handle the peaks. Have a direct relationship with the railroads. Non-Asset: Tap into the railroads’ container capacity, as well as, into bi-modal and asset-light providers for container and dray capacity. Have a direct relationship with the railroads. Broker: Tap into all IMC segments, but do not have a direct relationship with the railroads. An industry trade association representing the combined interests of intermodal freight transportation companies. Imported traffic movement from an origin port to an inland point on an ocean bill of lading. That which constitutes a load. The freight in or on a rail car, container or trailer. The process of moving a container or trailer to and/or from a rail car. The term given to indicate the total financial liability is limited to a fixed amount. Within intermodal, limited liability is used to describe the liability given to certain commodities that would be less than standard coverage. When a drayman stays with a container or trailer while being loaded or unloaded. The term when the contents of a container or trailer are shifted inside the unit sometime after it leaves the actual origin and before it arrives at the final destination. A person hired to help unload a container or trailer instead of using the driver. A misuse charge is a penalty imposed by the railroads for taking a unit out of one metro area and returning the unit to another metro area empty or loaded. For example, if a unit outgates in Detroit and ingates empty or loaded to Chicago, a misuse charge will occur. These charges are determined by participating railroads and can be changed at any time. The transportation of freight under a single contract, but performed by more than one mode of transport. Intermodal transport is an example of multimodal transport. The process whereby the railroad will inform the drayage provider or IMC that a unit is available for pickup. The notify will place the move in a destination dwell status. A unit is considered off-route when it travels in an invalid lane (such as Las Vegas to Allentown) or when it travels on a non-participatory railroad (such as BNSF Railway). An IMC will be charged off-route charges by REZ-1 until that unit is brought back to a valid terminal. A rail unit used for bulk commodity transport that is not damaged by the elements. Refers to movement of a truck over the road instead of an intermodal movement. The process of checking a container or trailer out of an intermodal facility. The outgate process includes inspection of the unit, input of data into the Union Pacific computer system and then filling out of the J-1. A detailed specification as to goods packed into a container or trailer. Charge based on a fixed rate per day, which a carrier makes against another carrier or customer for use of its containers or trailers. A secure number provided to parties listed on the waybill. It allows only those parties to receive a container in order to outgate from our ramp facilities. Transportation of a highway trailer on a railroad flatcar. A railroad term for trailers loaded on flatcars. A sign affixed to a rail car or truck, which indicates the hazardous designation of the product being transported in that vehicle. A unit design to ship heavy bulk commodities. An assigned group of containers, trailers or cars used to satisfy the transportation requirements of a customer. A state or local government that owns, operates or otherwise provides wharf, dock and other terminal investments at ports. Equipment owned by a person or a company that is not engaged in the service of common carriage. Commodities that are entirely not allowed to be loaded and shipped. An ID number given to an IMC by REZ-1. An IMC will use this number when they make reservations to prove that they are a valid member of the EMP reservation program. Slang word for an intermodal terminal. Ramps were originally structured, permanent or temporary, from which trailers or machinery are driven onto or off of a railroad flatcar. A movement of lading from the intermodal ramp closest to the customer to the receivers from door (dock). A movement of lading from the intermodal ramp closest to the customer to the closest intermodal ramp to the receiver. Any change made in a consignment after the arrival of goods at their billed destination. When the change is accomplished under conditions which make it subject to the reconsignment rules and charges of the carrier. A shipment generated by the railroad for repositioning empty units from one location, to another location in which they can be better utilized or to a location that is deficient. A term used by REZ-1 to describe a railroad terminal, where an empty unit is picked up with a valid booking/reservation number. Commodities allowed to ship under specific guidelines. These same items would be considered prohibited if not shipped within specifications. Typically, restricted commodities have a limited liability. An example would include steel. Movement of an empty container or trailer that generates revenue for the railroad. Done for repositioning purposes. An independent agent that handles all reservations and billing functions for EMP customers with a centralized system to manage assets through the internet. REZ-1 also handles UP trailer reservations for selected points. Containers or trailers that are interchanged between two railroads by means of drayage. Standard Carrier Alpha Code, used for identifying truckers, railroads and other conveyors. A device for fastening or locking the doors of a rail car, container or trailer. This is done for security and integrity of the shipment. The person or company who is usually the supplier or owner of commodities shipped. An intermodal flatcar that was specifically designed to place one container on top of another for better utilization and economics. Also referred to as a well car because the cars are depressed in the center to allow clearance of the double stacked containers when moving under low-lying structures. The STCC system is a 7-digit coding structure designed to classify all commodities or articles which move or may move in freight transportation. Containers or trailers that are interchanged between two railroads while on the railroad flatcar. A charge assigned to the shipper or consignee for holding containers or trailers at an intermodal terminal beyond the free time allotted to them. A street interchange transfers financial responsibility of a unit from one IMC to another on a date and time that is specified by the drayage firm in control of that container or by an IMC that has financial responsibility for that particular container. The time a container or trailer is away from the possession of the railroad. The process of removing cargo from a container. The process of loading cargo into a container. Equipment owned or leased by a railroad. Each railroad considers their own equipment as system equipment. A tank car is used to ship compressed or liquid commodities. A legal listing of rates used when moving regulated traffic by rail. A rail trailer or container mounted on a chassis that is transported on a rail car. Also known as piggyback. A rectangular shaped box with permanent wheels attached for the transport of goods on rail, highway or a combination of both. A unit that has its own rear wheels, and therefore cannot be stacked on one another. The time that a unit is on the railroad. Transit starts from the ingate load at origin and goes until the notify at destination. Transit calculates the amount of time a railroad was in possession of a unit and how long it took to ship that unit from point A to point B. To physically transfer product from one transportation vehicle to another. A non-asset based company that sells & manages freight transportation services on behalf of their clients. Transportation brokers typically arrange and manage, on behalf of their clients, the entire transportation process of a freight shipment. Their service includes finding a qualified carrier (with the proper insurance and operating authorities) who can move the freight in a timely manner, negotiating a good rate and then managing the entire process from pickup to delivery. Full truckloads, also known as FTL or sometimes TL, utilizing van or flatbed trailers, depending upon shipment configuration. The trucking company that dedicates trailers to a single shipper's cargo. An acronym for Uniform Intermodal Interchange and Facilities Access Agreement, is a standard equipment interchange contract used in the intermodal industry that has been developed by water, rail and motor carriers and is administered by the Intermodal Association of North America. 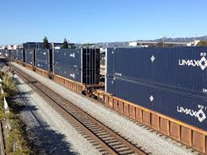 UMAX is a domestic interline container service offered by Union Pacific and CSX Intermodal. UMAX provides access to a fleet of more than 31,000, 53-foot domestic containers and demonstrates both carriers' commitment to maximize customers' shipping options, while featuring truck-competitive services. The event when a container or trailer is taken off of the train and placed on the ground for customer pickup. At this time, the container is mounted on a chassis and the party is notified. The event when the notify party is notified by the railroad that the container or trailer is available for pickup. An accessorial charge by truck and other mode carriers assessed when their equipment and/or driver/operator(s) are required by a shipper, consignee, or circumstances beyond their reasonable control, to wait or stand by at a pick up or delivery. A document covering a shipment and showing the forwarding and receiving station, the names of the consignor and consignee, the car initials and number, the routing, the description and weight of the commodity, instructions for special services, the rate, total charges, advances and waybill reference for previous services and the amount prepaid. An intermodal flatcar that was specifically designed to place one container on top of another for better utilization and economics. Referred to as a well car because the cars are depressed in the center to allow clearance of the double-stacked containers when moving under low-lying structures. Sometimes referred to as stack cars.